This winter, join Human Relief Foundation and food banks nationwide to feed those in need across the country. This winter, join Human Relief Foundation to feed those in need across the country. Vulnerable individuals and families in the UK are facing hardship for a number of reasons. They are then forced to go to food banks to provide for themselves. Working with food banks for our “Buy One Give One” campaign, we are urging people to donate food items to provide the necessities to those in our communities. “Buy One Give One” asks you to buy an additional item of food and drop it into your nearest collection centre below. This will then be delivered to the food bank for you. You can also donate £5 or more to your local office of your choosing. Our staff will then buy the food items and deliver them for you. Please donate by clicking on the buttons at the bottom of the page. 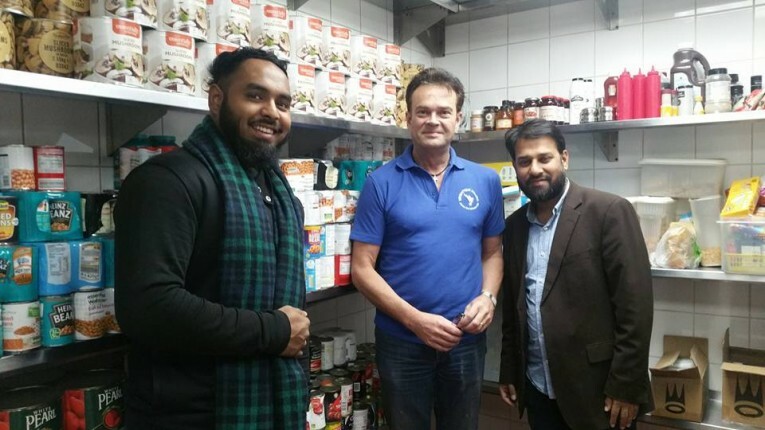 HRF Bradford is working with Bradford Central Foodbank, part of Trussell Trust. What is needed in Bradford? Tinned veg (carrots/potatoes/sweetcorn), fruit juice (1L), fruit juice (individual cartons), biscuits, carrier bags. Please drop off items at HRF Bradford on 2 Claremont, Bradford, West Yorkshire, BD7 1BQ. Opening times: 9.30am to 5.30pm. HRF Birmingham is working with Sparkhill Foodbank, part of Trussell Trust. What is needed in Birmingham? Volunteers. Please contact HRF Birmingham by calling 0121 448 0490 or visit the team on 347 Stratford Road, Birmingham, B11 4JY. Opening times: 9.30am to 5.30pm. HRF Manchester is working with Manchester Central Foodbank, part of Trussell Trust. What is needed? UHT milk (1 litre), small sugar (500g-1kg), instant coffee, tinned meat and jam/marmalade. Please call 0161 312 3434 for more information. Please drop off at HRF Manchester on Norwood House, 53 Brighton Grove, Fallowfield, Manchester, M14 5JT. Opening times: 9.30am to 5.30pm. HRF London is working with Whitechapel Mission, a registered charity which has been assisting Londoners to help the homeless since 1876. What is needed? Tea/coffee, sugar, baked beans, plum tomatoes, cereal/biscuits, brown/red sauce, squash/jam/honey, Pot Noodles/soups, tinned meats/tinned veg. Please drop off items at 93 New Road, Whitechapel, London, E1 1HH. Opening times: 9.30am to 5.30pm. Donate £5 or more and your specified office will buy the food items for you!